Enerco supply and install a wide range of Aluminium Roller Shutter Doors that look high in quality and very reliable a must have for your business. Available in sizes up to 3400mm wide x 4000mm high (max 8m²) with solid or vented lath sections this shutter is ideal for low risk security applications such as bars, kiosks etc Available as standard in a powder coated white, brown or cream finish. The double wall, foam filled lath provides both security and insulation from heat and noise. Easy to use the door can be supplied with belt, rod crank, spring assist or electric operation. Manufactured in sizes up to 4000mm wide x 5000mm high (max 12m²) with solid, perforated, punched or punched and glazed sections. The maximum width of the vision shutters is 3m and provides 45% vision through the lath with the perforated version offering 17% vision. 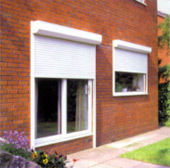 Used internally or externally these shutter are supplied as standard in white, brown or cream powder coated finishes but can be powder coated to any RAL or BS colour. 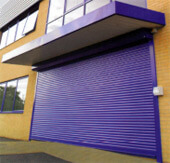 Use for high security domestic sites, medium security office / commercial use, small shop fronts and garage doors. The model 3801 has been approved by the LPCB (Loss Prevention Certification Board). Produced to suit applications up to 6000mm wide x 5000mm high (max 20m²) this shutter is ideal for larger openings where a compact shutter with high security is required. Supplied as standard in white, brown or cream the double walled aluminium lath shutter can be powder coated to suit any RAL or BS number. A versatile shutter used to secure openings up to 5400mm wide x 4000mm high (max 16m²), the model 7700 is available with a solid insulated curtain or as a punched / punched and glazed lath section offering 58% vision through the curtain. A choice of 11 standard colours are available including wood grain effect lath. 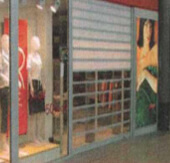 Design to offer vision for applications such as shop fronts, shopping malls etc this single wall aluminium lath shutter is available to suit openings up to 6000mm wide x 5000mm high (max 20m²). The lath can be punched or punched & glazed and is supplied as standard in white, cream or brown but can be powder coated to any BS or RAL number. 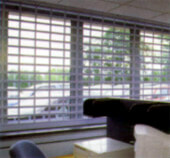 An aluminium roller grille, this shutter is available up to 5000mm wide x 4000mm high (max 13m²). 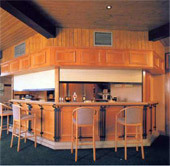 The curtain can be manufactured in either a brick bond or in line arrangement and comes as standard in an anodised aluminium finish which can be powder coated if required. by many local authorities for high street and shopping centre, suitable for bars and kiosks where permanent vision is required. A unique product which gives almost 100% vision. The curtain manufactured from clear transparent polycarbonate plate material which after machining is capable of being rolled and offers almost 100% vision. With a thickness of 5 / 6mm and a height of 100mm the plates are held with joining rails. Available in 3m widths the polycarbonate plates can be joined with H sections for shutters up to 6000mm wide x 4000m high (max 24m²).